Enjoy dolphin watching, snorkeling, and sight seeing on a four hour private charter in Historic Key West! Learn about the history of the Florida Keys, the Southernmost Point of the U.S., with live commentary from an experienced Captain.Tour is limited to a maximum of 6 travelers. Bring your sunglasses, towel, snacks, and other things you'd take to the beach. Arrive at the slip 15 minutes before departure time. Before heading out, your Captain will give a short safety briefing. Your drinks and snacks will be stowed in coolers with complimentary ice and bottled water. Then, you'll be ready for your private tour. As your Captain cruises out of the Key West Historic Seaport, you'll see many private yachts of the rich and famous in the marina. This will be your first peek at Key West from the water, with all the yachts anchored off shore and where many of the Sailors stop for periods of time as they travel to and from the Caribbean. When we make the turn out of the harbor, you'll feel the cool ocean breeze as you leave the busy harbor behind. 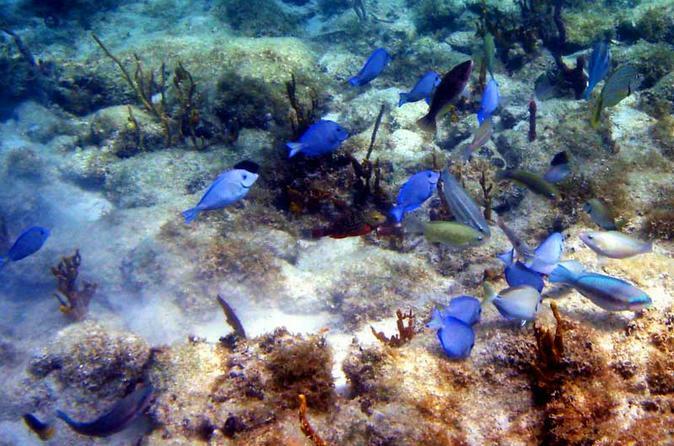 Once anchored, we'll provide a mask, snorkel, and fins to start your underwater adventure. Life jackets and noodle floats are also provided. After getting safely back onboard, we’ll continue on to find some of Key West's famous Atlantic Bottle Nose Dolphin. No two trips are exactly the same; sometimes we will go find the Dolphin first, and then go snorkeling.